So first up, I am sorry. Sorry for holding out on you, and only sharing these amazing Overnight Chocolate Peanut Butter Cup Oats with you now. Sorry for the fact that once you eat this deliciousness for breakfast, you won’t be able to have normal oats again. Sorry if you have kids, and they try these oats, because they will be asking for ‘chocolate peanut butter cup oats’ from here on in. During the week, oatmeal is always a staple in our house. They are just so easy to prepare, and if prepared correctly, they keep those bellies full for ages. As you know, I like making a couple batches of different things on the weekend, as kind of a way to cheat my way through being super organised throughout the week. It also helps for those times when you are feeling lazy, or when it’s cold, and you can’t get out of bed, and then the kids lose their cool because they are starved, and have never been fed in their lives. Yeah those days are fun. So, I make a big batch of these overnight chocolate peanut butter cup oats on a Sunday night, and they last us through Wednesday. If you are heading out for work, make them up and then pop them into separate little mason jars, to make for super cute ‘grab-n-go’ breakfast cups. If you prefer your oats hot, make these up as per the instructions, and then in the morning just give them a quick nuke in the microwave (if you use one), or 5 minutes over low-med heat on the stove top. You will probably need to add a little more milk of choice, to loosen them up. The oats will be soft enough to eat after 3 hours. If you prefer your oats warm, then just add a little bit of milk, and heat over low-med heat in a saucepan for about 5 mins. What is your favourite way to prepare oats? Be sure to leave a comment, like on Facebook, tweet on Twitter, or pin to Pinterest for later. This was absolutely fantastic! All three of my kids (one who does not prefer cooked oatmeal and protests it weekly) loved it. I followed the recipe to a T . Thanks again, for a great one, Donna! Oh you are so welcome Blithe 🙂 I am glad they are working out for you, and for the kids especially!!! Thanks for popping by Susan! Mine was inspired by a chocolate peanut butter smoothie I always make. I love the smoothie, but I wanted to make it a bit more filling for the kids so they didn’t ask for snacks 5 minutes after breakfast – hence the oats 🙂 I basically put the smoothie in the oats and we had a winner! Wow! I’m not sure if that is breakfast of dessert! It looks SO GOOD! This looks great! We love to have oatmeal but we’ve been making the same thing over and over. This would be a great change. Thank you!! This looks SO good. 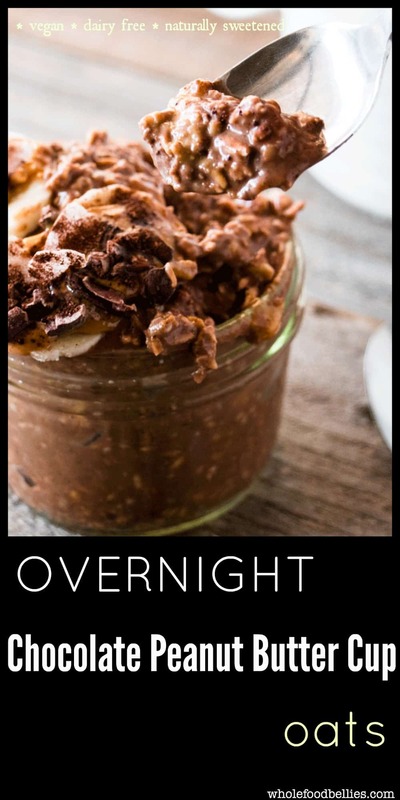 I’ve been wanting to try out overnight oats and I think I just found the recipe I want to use! Chocolate oats sounds divine. I know it to be true; I recently discovered this match made in heaven in one of my own kitchen experiments. Adding in the rest, peanut butter, bananas…just sounds amazing!! I will take mine warmed please. Nummy! Haha, yes I have been warming mine up too this week (extra cold mornings)! I love to make my own oats at home. Chocolate and PB is one of my favorite flavor combos. We love overnight oats here at my house – I make them EVERY Sunday for the kids for the week. I’m gonna have to add a couple of jars to my line-up so mama can have this special treat one morning – YUM! Haha enjoy Kathryn 🙂 Yes overnight oats are amazing, they make mornings so less stressful with the kids, especially when they wake up starving! Yum!! I’m always looking for oatmeal variations as that is one of my husband’s favorite breakfast because it keeps him full all day! This is so perfect as I can make ahead and he can grab one on the go during the week! Thats exactly what we do around here Nellie – I have a couple pots in the fridge, and he just grabs one on his way out the door! Haha thanks Rachel! I know, right? How could you say no! I keep looking for more things to do with peanut butter so rather excited to come across your recipe. 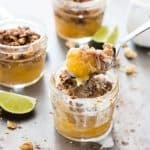 Yay 🙂 We are a little bit obsessed with peanut butter around here (well, my daughter and I at least), so we have many many peanut butter recipes! That would be a fun holiday breakfast! 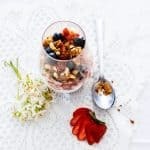 My three year old daughter adores overnight oats, and when I make these for her she will be in heaven! That pb, the vanilla, the cocoa… bliss. I still have yet to try the overnight oats, but this sure makes me want to jump on the train! Oatmeal is a healthy option. We do have it in different form for breakfast. I prefer savoury dishes. But this looks lovely. Kids would love it. I’d love to wake up to this for breakfast. This recipe sounds insanely delicious and pretty simple to prepare. What a great breakfast recipe!! Love that it’s made so quick and easy! A winner! We really struggle with breakfast ideas around my house, but who wouldn’t want to wake up to chocolate and peanut butter?! Trying this one! Beautiful job on this delicious looking breakfast; our whole family will love this one!